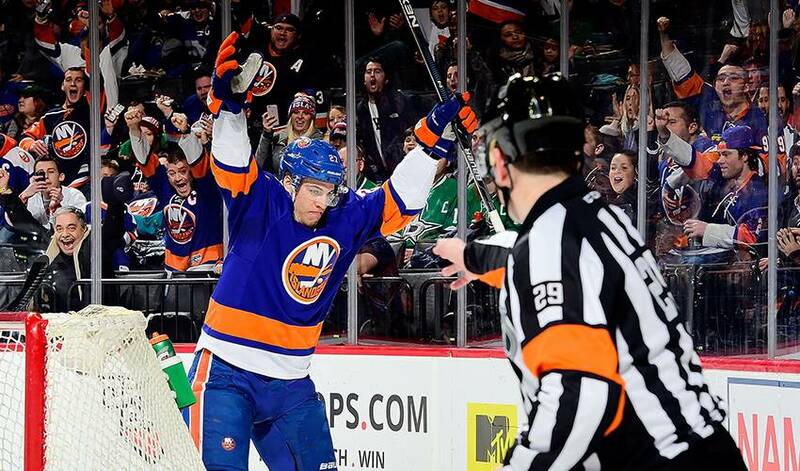 New York Islanders forward Anders Lee has always brought a football mentality to the game of hockey, and for good reason. New York Islanders forward Anders Lee has always brought a football mentality to the game of hockey, and for good reason, he was a star quarterback for the Edina High School Hornets. In his junior season, he tossed 14 touchdowns, steering his school to a 10-1 record and a spot in the Minnesota state championship. As a senior, he scored 32 touchdowns and was named 2008 Minnesota Football Player of the Year. But after football ended in the fall, he was quick to trade in his cleats for skates. After all, hockey was the sport he loved just a little bit more. So when he went off to Notre Dame University on a hockey scholarship, his days on the gridiron concluded. It was an easy decision for Lee, especially since the Islanders had selected him in the sixth round (152nd overall) in the 2009 draft. “It really was a no-brainer,” said Lee, also was a standout high school baseball pitcher and third baseman. “I love both hockey and football, but hockey was the sport I liked to play more. My Dad got me into the game when I was young. He was a goalie. Lee did know some of the Notre Dame football players and went to four or five games every fall, sitting in the first row of the end zone with his hockey teammates. Does he see any similarities between the two sports? “Football is a brute game and just like hockey you have to bring a high compete level to each game,” the 27-year-old Lee said. “The big difference is there are more set plays in football. Lee made the right decision to choose hockey over football. The 6-foot-3, 231-pound forward scored a career-high 34 goals last season and he already has checked in with 27 goals through 51 games this year. Only Alex Ovechkin has scored more goals, with 30, in the 2017-18 campaign. Yet, Lee was left off the Metropolitan Division all-star in Tampa Bay last weekend. Instead, he enjoyed some rest and relaxation at home in New York to prepare the Islanders post all-star game push for a playoffs spot. With another big game this Sunday, the Super Bowl, which pits the New England Patriots against the Philadelphia Eagles, we asked Lee for his thoughts. The Super Bowl will be contested in Minneapolis, not far from where Lee was raised in Edina. “I was a little bitter my Vikings got beat by the Eagles [in the NFC championship game on Jan. 21], but Philadelphia deserved the win. They blew out Minnesota,” Lee said. “It’s getting to the point where it’s difficult to go against Tom Brady and the Patriots. Of course, the whole Nick Foles-Carson Wentz quarterback situation with Philadelphia is interesting,” added Lee, referring to Wentz going down with a serious knee injury in early December, which left Foles to lead the Eagles all the way to the championship game.